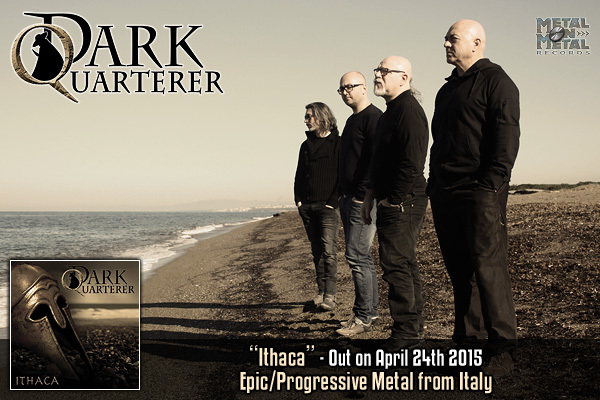 DARK QUARTERER, the Italian creators of epic/progressive style, started out in 1980, in a Tuscan coastal town named Piombino, however the band's roots date back to the early '70s. Two friends, bassist/vocalist Gianni Nepi and guitarist Fulberto Serena, got together driven by the passion for the contemporary hard and progressive rock music, but it wasn't until 1974 when they were joined by drummer Paolo Ninci, that the new band got a name, OMEGA R (OMEGA ERRE). 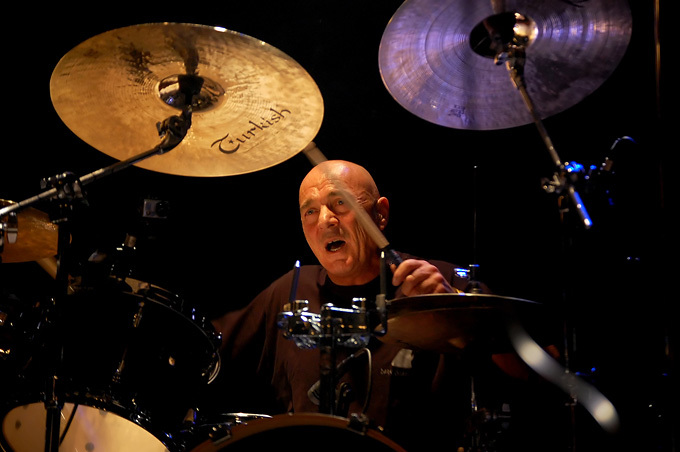 For several years the trio was honing their craft playing covers of bands like Grand Funk Railroad, Deep Purple, Black Sabbath, Thin Lizzy, Led Zeppelin, Uriah Heep, Cream, Ten Years After, Jethro Tull, Gentle Giant and Colosseum. It was the band's friend and guru Duccio Marchi who suggested they should start composing their own songs and also came up with the DARK QUARTERER name ("quarterer" being the ancient English word for a man who butchered cattle). Fulberto Serena started bringing ideas, upon which the whole group was building until definitive versions of the songs like "Dark Quarterer", "Lady Scolopendra", "Red Hot Gloves", "The Entity" or "Gates of Hell" (in which the protagonist actually wanted to live and die in the name of evil to dethrone Lucifer in the underworld) were created. In 1985, the band recorded a 9-song demo, which received a very good review in Rockerilla magazine. 1987 saw the release of the band's self-titled debut full-length put out in by Label Service and containing 6 songs known from the demo. In spite of poor sound quality, it received great reviews (it was Claudio Cubito from Rockerilla who called them the originators of the new genre, epic/progressive), and is now considered a cult classic. In 1988, DARK QUARTERER were contacted by Giorgio Mangora (Cobra Records), who offered them the production of a second album. With all expenses covered by the label, "The Etruscan Prophecy", an album heavily influenced by the legends, magical and esoteric tales of their homeland (called Etruria in ancient times), was soon released. But just when it seemed that the group was finally taking off (the album was enthusiastically reviewed by the editor in chief of the German Metal Hammer magazine, who spoke of DQ as the only Italian band composing real heavy metal), Fulberto started having an identity crisis and eventually left the band in 1990. The continuation of the activity without the main songwriter proved very difficult for Gianni and Paolo. Even when, in 1991, they recruited a new guitarist, Sandro Tersetti, whose style was more bluesy (Ritchie Blackmore school), the group seemed at a loss. They wrote and recorded a demo with 4 songs sung in Italian (songs which were later recorded for their third album with English lyrics). It was Gianni who was now responsible for composing most of the music and all the lyrics, but Paolo and Sandro contributed with their ideas. They started finding their way again and wrote new songs in English, which they put out as another demo in 1991. In the same year the band participated in the Festival degli Sconosciuti in Ariccia, with a Led Zeppelin inspired song "Out of Line", winning the contest hands down, which lead to them being invited to take part in a program on RAI 2, playing their music on the national TV. Soon after, a German record label, Inline Music contacted the band and offered them a deal. The third album, "War Tears" was recorded in Hamburg and released on compact disc through Gorgon (Inline Music sub-label) in late 1994. The sound was stunning and the quality of the recording perfect but the group hadn't yet re-established its identity - in fact commercial hits like "Out of Line" were mixed with Black Sabbath inspired pieces like "Nightmare". Bad luck had it the label went bankrupt later on resulting in the album being difficult to find. The band however soldiered on and played many gigs at motorcycle rallies and some metal festivals all over Italy, until Sandro Tersetti decided to leave in 1998. The new crisis didn't last long though - still in 1998 DARK QUARTERER enlisted a then 19 years old guitarist Francesco Sozzi, son of their friend Gino Sozzi, who a few years later became the band's manager. Francesco brought with him new energy, and proved to be in harmony with the rest of the group from the start, combining the style of Fulberto and of Sandro, but still remaining personal. 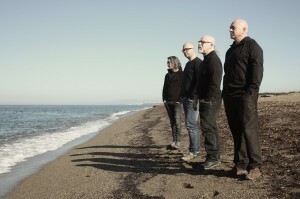 As a result of the communion of ideas and various musical inspirations, the rejuvenated band created their fourth album "Violence", released in 2002 through Italian label Andromeda Relics. The same year also saw the re-release of "The Etruscan Prophecy" on CD and vinyl through Metal Legions (a division of the new Giorgio Mangora's label, Comet Records). In 2003 and 2004 respectively, the band's debut was re-released on CD by Unisound Records and on vinyl by Eat Metal Records. In 2003, keyboard player Francesco Longhi, who had contributed as a guest to "Violence", joined as a full-time member of the band. DARK QUARTERER's live activity soon increased considerably. Their first and the most important show abroad was in April 2004, at the 2nd edition of the revered Keep It True festival in Germany. They shared the stage with many legendary bands from all over the world, including MANILLA ROAD, BLITZKRIEG, ATTACKER, HALLOWEEN, BROCAS HELM and CLOVEN HOOF. This event helped putting them back on the European metal map and opened the gates for invitations to further international festivals. 2007 saw the start of DARK QUARTERER's co-operation with Giuliano Mazzardi and his My Graveyard Productions, that first re-issued on CD "War Tears" (and two years later, "The Etruscan Prophecy"). The band was invited to play as a headliner at the 1st edition of Play It Loud! (alongside RAVEN, BLITZKRIEG and others), and at Legends Never Die (alongside STRANA OFFICINA, ADRAMELCH, CRYING STEEL...), both organized by Giuliano. DARK QUARTERER began recording their fifth studio album "Symbols", containing six songs dedicated to as many historical characters with their lives showing most aspects of humans becoming just "symbols": Tutankhamun, Gaius Julius Caesar, Genghis Khan, Jeanne d'Arc, Kunta Kinte and Geronimo. These six scores for a journey through time and emotions saw the light of day in June 2008, released by My Graveyard Productions again. The band continued to conquer the stages, appearing in 2008 at Up the Hammers III festival in Athens (where they played with MANILLA ROAD and OMEN, among others), and in Italy headlining MotorockAs FireFest and MetalItalia On-Stage. 2009 brought more international events: DARK QUARTERER headlined the first editions of Hammer of Doom festival (with THE DEVIL'S BLOOD) and of Malta Doom Metal festival (alongside FORSAKEN, NOMAD SON and others), while in their homeland - Made in Hell fest. That year, they played also a special show at the 19th century theater Teatro dei Concordi, located in a medieval Tuscan hamlet, Campiglia Marittima (Livorno), which was an invitation-only event, filmed for the forthcoming DVD. "Under the Spell" (a two-hour-and-a-half concert) was released on DVD by My Graveyard Productions in January 2010, and as a double live CD in 2012. In January 2010, the band flew to Norway to play at the Metal Merchants II festival (where they shared the stage with OMEN, SLOUGH FEG, TANK...). And in November, they went to Germany to play at Metal Forces XIII (DIAMOND HEAD, BLITZKRIEG...). Between these 2 festivals abroad that year, they played at several national events, including Heavy Metal Night III, 3 Days in Rock, Tuscany International Festival, Rock Inn Somma and Metal Meccanico III. In 2011, there was especially one event worth mentioning: in April, DARK QUARTERER played at the 25th anniversary of the befriended "Loud n' Proud" radio show (on Radio Diffusione Pistoia since 1986), and were joined on the stage by Sandro Tersetti, who performed with them several songs. After these concerts the band dedicated their time to the work in the studio. To celebrate the approaching 25th anniversary of their debut album, they arranged it anew and played in the current line-up. This re-recording is released by My Graveyard Production in September 2012 under the title "Dark Quarterer: XXV Anniversary". In 2013, Shadow Kingdom Records released a double CD package containing the remastered first edition of "Dark Quarterer" album from 1987 together with "Dark Quarterer: XXV Anniversary" as a bonus disc. They came back on stage in 2012, first venturing to Cyprus to play at Power of the Night VII festival (together with PRAYING MANTIS and CLOVEN HOOF, among others) and in October started the promo tour for the anniversary CD. It included three dates abroad: Hammer of Doom V festival in Germany (alongside PENTAGRAM, THE SKULL, DEMON...), a gig in Athens and another one in London (this was the band's first time in the UK). 2013 saw the band traveling to Sweden to play at the 5th edition of the old school metal festival Muskelrock (where they shared the stage with ARIA, NIFLEHEIM and many others) and in October to the island of Malta, to play at the 5th edition of the Malta Doom Metal festival (alongside DOOMSHINE, NOMAD SON and others). In January 2014, DARK QUARTERER traveled again to play in Cyprus, and then co-headlined Play It Doom festival in the north of Italy (with SOLSTICE and a few Italian bands). Apart from several other Italian shows that year, they played in France at Teilia Prog Fest (sharing the stage with VULCAIN, among others), in Denmark at the Metal Magic VI festival (with AURA NOIR, NUNSLAUGHTER and plenty of other old school metal bands), and finally in Austria, headlining Doom Over Vienna IX (sharing the stage with PROCESSION and a few other acts). Meanwhile, the band started working on the new songs. In 2014, during My Graveyard Productions' hiatus, Metal on Metal Records entered the picture, even though the label owners had known the band personally since a long time (Keep It True festival in 2004, to be precise). The friendship had developed over the years and now a new step was taken: they decided to work together and inked a deal in the first days of 2015. Right after that, the band entered the studio (their own Woodstock studios, which is also a private music school Gianni and Paolo had started over a decade earlier), and recorded their new album "Ithaca", all in January. April 2015 saw the release of DARK QUARTERER's sixth full-length album, inspired by a 1911 poem titled "Ithaca" by a Greek poet, Konstantinos Kavafis, which utilized the Homeric return journey of Odysseus to his home island as a metaphor for the journey of life. Stylistically speaking, it's the continuation of the last studio work "Symbols", but widening the sound spectrum towards solutions so far only grazed, and a further growth of a band that has maintained, despite the vicissitudes, that style that makes it so unique.